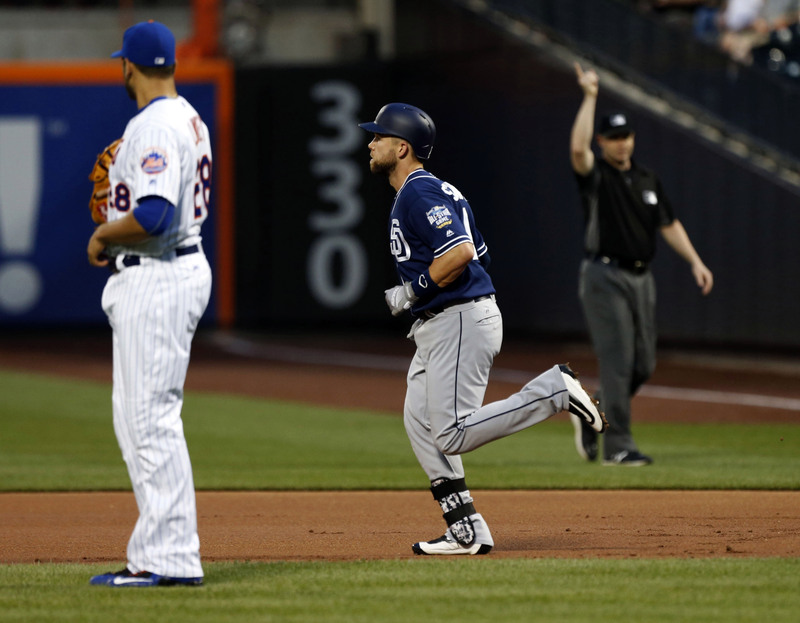 With their winning percentage down to .500 and their playoff hopes growing slimmer by the day, the Mets looked to bounce back from a sweep at the hands of the Diamondbacks against the Padres on Friday night. Logan Verrett, granted another shot as a member of the Mets rotation, was opposed by San Diego right hander Paul Clemens, who entered the game with a 7.63 FIP on the season and a 6.21 mark for his career. Instead of making the most of his extended rotation opportunity, Verrett deposited a foul smelling substance in the Mets’ bed. After a single and two walks loaded the bases for the Padres with no outs in the first, Ryan Schimpf launched a grand slam to put the Padres up 4-0. Jabari Blash followed that with a home run of his own, and the Mets were down 5-0 before they even came to bat. Thankfully, the Met offense managed to do at least a little bit of damage against the truly awful Clemens. After a quiet first inning, James Loney singled to start the bottom of the second and Travis d’Arnaud followed with a line drive home run to left field to bring the Mets back within three. Alejandro De Aza lined out and Matt Reynolds and Verrett both struck out to end the frame. Alas, Verrett wasn’t done being a bad pitcher. After striking out Yangervis Solarte to start the third, Verrett allowed an Alex Dickerson double ahead of Ryan Schimpf’s second homer of the night, re-extending the Padres lead to five. Two batters later, Christian Bethancourt went deep as well, putting the Padres up 8-2 and ending Verrett’s night, as well as his time in the Mets rotation (though it seems he’s going to be replaced with Jonathon Niese, which might somehow be just as bad). The Mets mustered a walk and a hit in the third and fourth innings respectively, but the deficit remained at six runs. In the fifth, Curtis Granderson ground a single into center field with one out, then advanced to second on a slow ground out. Neil Walker worked his third walk of the game, before Jay Bruce singled on a ground ball to right field, scoring Granderson from second and cutting the Padre lead to 8-3. Loney was called out on strikes to end the threat. In the sixth, the Mets continued to inch closer. d’Arnaud led off with a single and De Aza reached base on a scary hit-by-pitch that seemed to catch him in the face (he remained in the game). Reynolds then doubled to score d’Arnaud and put runners on second and third with none out. Ty Kelly followed with a single to score De Aza from third and put runners at the corners. Unfortunately, the Mets only got one more run, as Granderson struck out, Wilmer Flores drove in a run with a ground out, and Walker grounded out. Still, the Mets were back in the game with the score at 8-6. Meanwhile, the Met bullpen was doing a fantastic job of keeping the Mets in the game. Seth Lugo (2.1 IP), Erik Goeddel (1 IP) and Hansel Robles (3 IP) retired all 19 Padres they faced after relieving Verrett, striking out eight in the process. If Goeddel and Lugo continue to perform at this level (and their uptick in stuff upon moving to the bullpen gives some hope that they can), they could both earn significant roles in the 2017 bullpen. It’s telling that we’ve reached the point of the season where one of the few positive comments is about potential 2017 bullpen pieces. Unfortunately, the Mets wasted the bullpen’s herculean effort. After cutting the deficit to two by the end of the sixth, the Mets were retired in order in the seventh, eighth, and ninth by Brad Hand, Ryan Buchter and Brandon Maurer respectively. No ball was struck particularly well as the Mets, who continue to play without any apparent energy or urgency, went quietly into the night. The loss drops the Mets’ record below .500 at 57-58, and they now have a negative run differential (-1). Miami and St. Louis both lost thankfully, keeping the gap for the second wild card at three games, but the Mets’ hopes for October baseball continue to fade with 47 games to play and three teams to leapfrog to gain the second wild card. Jacob deGrom takes the mound opposite Jarred Cosart Saturday as the Mets attempt to end their four game skid.